Another idea was to use the new web workers to do the heavy lifting in an separate thread, not blocking the gui. This is something flash can’t do. So I created a version using a web worker for the encoding. Comparing the different browsers Nitro and V8 are a magnitude faster than TraceMonkey. Firefox 3.6b2 shows some improvements, but it’s still a long way. Probably the Mozilla guys should consider adopting Nitro or V8? He used the AS3 (ActionScript) JPEG encoder as a starting point. It’s worth noting there’s also a PNGEncoder there too; that’s a port waiting to happen. “p01” of Opera mentions that Opera supports Canvas.toDataURL(‘image/jpg’,quality), with a float between 0..1.
oh great, do you know how fast opera is? Errr.. Why would anyone do that? Are there any use cases where this would be practical? I’m beginning to get bored with “this js engine is so fast that it could _____”… You can encode an image server-side in a dozen milliseconds and then send much smaller pic to the browser. That way you save time on dealing with the pic and sending it. @Schill: This is good, because the js based encoder does not work in Opera currently. The window.btoa() method is not available. @Breton: A PNG encoder wouldn’t make much sense, and porting the AS3 version would be not that simple, because most of the encoding is done in the native zip compression method of the AS3 ByteArray. @mare: Originally I just wanted to have a jpeg encoder with variable quality for an Appcelerator Titanium application. Encoding unchanged images on the client side indeed doesn’t make sense, but a canvas created image is something different. Mostly creating the encoder was a) pushing the frontier b) practice in optimizing js code and using web workers. @mare: This is an experiment to see what’s possible. Very often advances like this are created without any end product in mind, only to be used later in ways the original creator never intended. Penicillin was a neat lab trick for a decade before scientists began realizing its true potential. Rubber was a useless natural substance until Charles Goodyear found a way to make it more durable. While this doesn’t rank up there with these advances, step back and take a breath before tearing down someone’s work. It is sad that it doesn’t work on IE (well, IE doesn’t support canvas, so it would be hard to get a CanvasPixelArray, anyway). @ajaxianreader123 While I see your point I think you’re presenting a weak analogy. Encoding images is a solved problem. Penicillin solved an unsolved problem. This solution does not improve the current encoding solutions. Goodyear improved tire rubber. My point is simply that the audience of Ajaxian knows there are inquisitive programmers who like to experiment — and I would agree that, in general, experiments (like Andrea’s!!) can lead to new, useful, ideas. However, being that the audience has several of these smart programmers in its ranks, maybe Ajaxian could focus on useful things mostly, not ideas that have no practical application now, and probably never will. How is this not useful? its a shame the fundamentals of js aren’t great with images, I’d love to see quality image resizing ability, today even with the latest firefox and its ‘quality image rendering’ the quality is poor, its still designed in terms of rendering performance instead of being powerful. 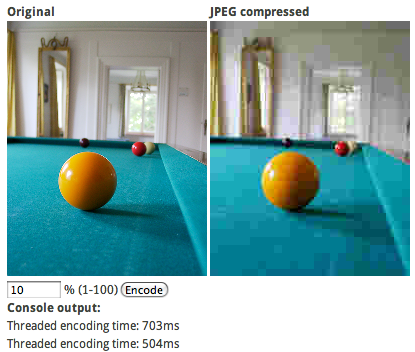 If a user comes to your site with a 30meg 1080p bitmap, would you rather tell them to get lost and make the image smaller (potentially requiring them to research how exactly they should rescale and save in a more compressive format).. or would you rather your client side code saw the problem, downsampled and resaved in jpeg and ‘just worked’? I know what I would rather.. just because we understand the limitations that exist today, doesn’t mean we should accept them, the fact that users have had to learn such technical details in order to use websites today isn’t a good thing. JS needs to be able to expose more control over image manip, and then yea processing 30mb of data would be faster than uploading 30mb of data.. sure the server could resize 30mb of data a ton faster but uploading 30mb of data takes a LONG time, most internet connections today still have terrible upload capacity..
Not to mention the shear reality here.. regardless of today’s JS ability, do you think it makes sense that a client program needs to upload data to another machine in order to manipulate it.. that’s ludicrous.. apparently you missed the whole point where I said ‘just because that is today’s reality doesn’t mean we should accept it’..